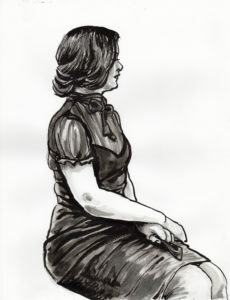 Here are a few sketches from Dr. Sketchy’s this past weekend. This month’s “Bizarre” theme was a tribute to the “Sweet Gwendoline” fetish comics of artist John Willie. As you can probably guess from these drawings, I was seated “behind” the models (meaning they spent most of the session facing away from me)! I’ll have to remember to show up earlier next time so I can get a better seat.